I debated whether to make this purchase for about a year, but finally decided that it would be good to have a backup for the Babylock Embellisher. Also, since I write so many machine needle felting tutorials, I thought it would be helpful to know how well they work when using different equipment. Bernina packs the accessory set with a helpful CD that walks you through the steps necessary to set up the attachment (along with some basic tutorials). There are quite a few steps involved, but all of them are easy to perform. For example, you must remove the bobbin, bobbin case, and shuttle hook from the lower part of your machine. Then you remove the presser foot, needle, needle holder thumb screw, and stitch plate. I would suggest that you have a special container handy in which you can place these items. If your studio or sewing area looks anything like mine, you’ll understand the wisdom in this. Next, you insert the special stitch plate with the large hole, mount the needle punch needle holder with its large screw, attach the Needle Punch presser foot, and drop the feed dogs. 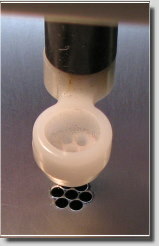 The bobbin case door remains open while using this attachment. Much of what I say from this point on will be framed as comparisons and contrasts with the Babylock Embellisher. As I began experimenting with the Bernina Decorative Punch Tool, I immediately noticed some differences. The Bernina Needle Punch reminds me more of hand needle punching for several reasons. First, the five needles enter the fabric directly and go through an open hole. There is no resistance in the downward or upward motion so the fabric has more force on it in both directions, much like hand felting. The Babylock Embellisher has seven needles, seven small holes in its needle plate, and seven small holes in its cloth presser (which can be adjusted up and down). The individual holes of the needle plate and cloth presser provide resistance, keeping your fabric in a more stationary position. If you do free motion quilting, you’ve probably encountered the difference a straight stitch needle plate makes on your stitches since the fabric isn’t forced down into the larger hole of the zig zag needle plate. Although stitches are not the issue here, I found some fabrics ( such as organza) a little more difficult to work with using the Bernina attachment. Hooping proved to be an adequate solution. Of course, I tend to use fabrics that aren’t traditionally thought of as felting prospects. 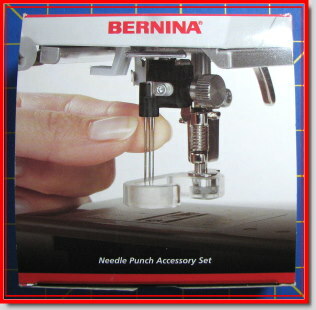 Bernina clearly states in the “application” section of its instruction sheet that its Needle Punch attachment is designed for wool fibers, wool yarn, felt, and boiled wool (the CD also mentions denim). The attachment does a beautiful job on all of these fibers. In regard to the resistance/nonresistance issue, there is another consideration. The small individual holes in the Babylock needle plate give little room for error. If you twist your fabric or your needle gets bent, you’re more likely to experience needle breakage with the Babylock. As I stated previously in my review of the Embellisher, felting needles are expensive. Second, owing to its large, open presser foot, the Bernina Needle Punch provides clear visibility of the needle action just as you would have with hand needle felting. The Embellisher’s cloth presser is opaque, so you don’t see the needles enter the fabric. I really enjoyed watching the interaction of needles with fiber. Do exercise caution on the open right side of the Bernina presser foot. It’s possible for your fingers to get dangerously close to the needles. As you can see from the graphic below, there is a big difference in the size of the needle holders. Additionally, there is a larger separation between the Babylock’s seven needles than the Bernina’s five needles. The Babylock has an individual screw for each needle. The Bernina has one screw that tightens or loosens all of its needles. The Bernina needle holder is simple to install; the Babylock takes a little more adjusting in the line up of needles with the needle plate holes. I like both of the needle placements for different reasons. The Babylock’s larger size means your work goes faster. The Bernina’s smaller size makes couching and detail work a simple task. I change the number of needles I use on the Babylock frequently, something I won’t have to do as often with the Bernina. As an added benefit, the Bernina and Babylock needles are interchangeable although not identical (the Babylock needles are a little thinner). Since the Bernina is also a sewing machine, lint buildup is a concern. I would recommend using the vacuum attachment made for computers after every felting session. If you practice good bobbin case hygiene, this shouldn’t be a problem. On the plus side, the features of the Bernina sewing machine such as needle up/down position and speed control are also available while felting. I really like having the needle holder stop in the up position so that I don’t accidentally bend my needles. For day to day use, having a stand alone machine facilitates in a projects flow since you don’t have to stop and reconfigure your machine. The downside of a stand alone machine is the price. Needle felting attachments cost much less than a dedicated felting machine. Also, in some circumstances having one machine that does it all can be a great convenience. Classes, group projects, travel, and space immediately come to mind. The decision really comes down to personal preference and what works best for each individual. After about five minutes of using the Bernina attachment, I noticed that I was no longer thinking of the differences between the two machines but rather enjoying the felting itself. I’m thankful that Bernina offers this optional attachment to its customers (on CB hook models) so that more people can enjoy this wonderful craft. Does the Bernina tool fit any machine, like a Singer? 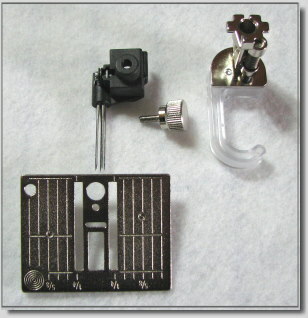 The Bernina Needlepunch Accessory only fits certain Bernina sewing machine models. However, more and more companies are making attachments for their machines or adding stand alone machines to their product line. You may want to check with your Singer dealer. i just watched fons and porter use the felting attachment on their bernina and i want to try this out. i have a bernina 1260. my little workhorse – i don’t know what a cb hook model is. please educate me. I contacted our nearby Bernina store and I was told that only the 230, 220, 210, 240, 430, 440 and the 630 models will work with the Bernina needlepunch kit. Is that true? I just got the bernina Accessory kit for Christmas…now find that you must have tthe upgraded thread guide replacement kit. Is this essential? Does it cost money? Do you install it yourself? I want to use this on two machines, 153QE and mostly the 140 back up machine. I do appreciate your article as im considering buying the bernina attachement for my 440,however my dealer doesn’t carry any piece to demonstrate it nor i know anyone around who does,i’m lil concerned about the point you raised with the attachemnet backfall of using light fabrics like organza and silk ( i do like to use these fabrics) any solution for that?? can we felt on velvet?? Thank you so much. 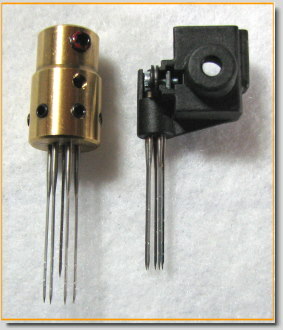 I have a 700 series, and the needle punch accessory looked like it would work! Now, I just have to find out how much and where to buy. The web sites I have looked at don’t exactly tell you that part! Thanks again! Feltcraf in the hope that I can convert my sewing machine. Is this possible or would I be wasting my time? I have a Bernina 440 QE when I try to embroidery the computer screen tells me that the top thread is broken when it isn’t. I push the blue start button and it sews 15 or 20 stitches and stops again and tells me the thread is broken. Is there something wrong with my machine? I’m Maria Meza from Peru and I’m keen on looking for a ‘needle holder’ which belong to Baby Lock BL4-838. I’m also looking for the complete equiqment which include all the needles in the package. I’m looking forward to hearing from you very soon. Hi like so many other people I’m now wondering if there is some way of finding an needle punch kit to fit my machine. I’ve got an 830 so is there some adaptor that will do the job. Feedburner SmartFeed works in any reader, on the desktop, web, mobile devices, and beyond. Fiber Art: If I Create It, Will They Come? 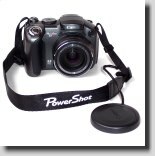 Shot it with a Canon! Kindly ask permission before using my photos or reprinting my writing. Contact information is on the “About” page. Thanks!